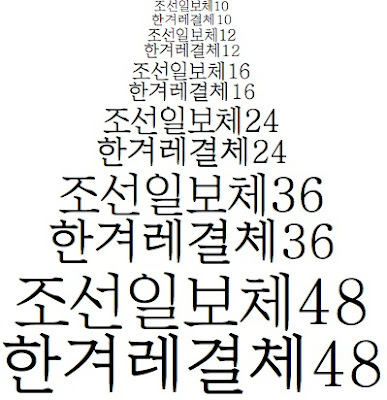 Found out that Hankyoreh has made its own font available for download at the newspaper site in late 2005. Here's the direct link to the zip file (0.8mb). Below is a capture from my word processor. The Hankyoreh font looks quite nice and should be pleasing for the eye to read - not insignificant for us who've learned the characters as adults. The specific trait is that the character blocks break the square pattern. For example, in the syllables 레 and 체 as seen below, the consonant is smaller in height than the vowel. Chosun Ilbo has followed suit and also put its own font available for download. The direct link to the zip file is here (6.9 mb). Below is a capture, from this site, comparing the two fonts. Chosun's one is less original, a variation of the Myôngje font, and as I mentioned above, Hankyoreh font appears to be good to read on paper, but as a lot of my reading of Korean is done online, I may not end up using it much, and other fonts, especially Gullim (or Gulim) are better when writing a document with a word processor.